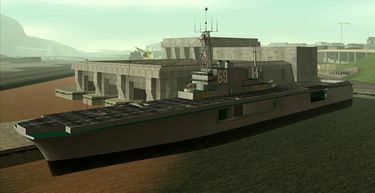 LHD-069 at the Easter Basin Naval Station in GTA San Andreas. LHD-069 is an uncontrollable military Landing Helicopter Dock featured in Grand Theft Auto: San Andreas. It is the first large-scale military ship to appear physically in a GTA game, and is docked at the Easter Basin Naval Station in Easter Basin, San Fierro. Accessible areas aboard LHD-069 include the flight deck and two internal decks; players do not have access to interiors of the upper levels of the ship's superstructure. The flight deck is actually capable of functioning as a short takeoff and landing strip for nearly any plane; in addition to the superstructure, two SAM sites are installed there, while a Hydra will also spawn occasionally at the same level after completion of the mission "Vertical Bird". The below decks resemble warehouses, with crates and explosive military armaments (which obviously explode when shot at, similar to explosive barrels) scattered and stacked around the area. Large loadings bays on the upper below deck and a wet dock in the lower below deck are also incorporated into the ship, although both the loadings bays are only functional and the rear door separating the wet dock with open waters opened during "Vertical Bird". Vending machines are available in a recreational room on the upper below deck, next to the stairwell to and from the lower deck; Forklifts on the upper below deck and a Vortex hovercraft close to the lower deck's wet dock (which can be driven out up the stairs) can also be commandeered. In addition, a Tear Gas pickup may be found near a small box in the lower below deck. If the player attempts to board the ship by land, they would have to pass through the Easter Basin Naval Station, obtaining an automatic 5-star wanted level; attempts to reach the ship via aerial means will also result in the player obtaining a similar wanted level and, up until "Vertical Bird", trigger the ship's SAM sites to shoot at the player. The well deck on the lower below deck of LHD-069, GTA San Andreas. The upper below deck of LHD-069, GTA San Andreas. LHD-069's superstructure in GTA San Andreas, which bridge is inaccessible but is equipped with two SAM installations. The only time the player will be able to visit the ship fully is during "Vertical Bird" by Mike Toreno, this also being the only time when military personnel is present in the ship. With its rear cargo door opened exclusive during the mission, the player is required to infiltrate the ship through the wet dock and fight/sneak their way up the ship, use a loading bay to lift a Hydra onto the flight deck, and fly away on the plane. LHD-069 is modeled after the real-life US Navy Wasp class amphibious assault ship, which was first commissioned in 1989 (compared with GTA San Andreas' 1992 timeline) and also uses an "LHD-x" classification to identify multiple Wasp class ships. As only eight Wasp class ships (numbered LHD-1 to LHD-8) were built, "LHD-069" is clearly a non-existent designation, with the "069" numbering deliberately selected as a running gag.